I typically prefer creamy Italian pasta dishes, but this recipe is one of my families favorites. The sauce is very simple and contains a few basic ingredients. Garlic, parsley, and olive oil add great flavor to the noodles while the breadcrumbs add a texture and crunch. Top it off with some freshly grated Parmesan cheese and freshly ground black pepper and you have yourself an addicting light pasta dish! This dish is best served using angel hair pasta. 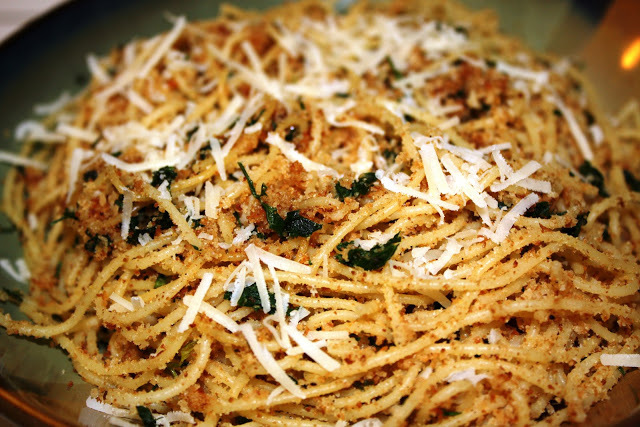 The thin strings of pasta combined with a little olive oil allow the sauteed breadcrumbs to stick. This recipe was adapted from a William Sonoma Pasta cookbook I purchased a few years ago and I have been making it at least once a month since then. The main changes I made were to use a lot more herbs, garlic, and breadcrumbs. Also, I made my own Italian-style Breadcrumb mixture starting with Planko breadcrumbs as the base. I’ve recently noticed the large ingredient list on the side of any store-bought breadcrumbs. As it is, the only vegetarian brand I’ve come across from Ralphs is Cento Bread Crumbs (Italian Style). But even these have a huge ingredient list. I therefore also modified this recipe by using fresh store-bought plain breadcrumbs (which contain no processed ingredients) and adding my own Italian seasoning. I modified the recipe accordingly. This is one of my husbands favorite Italian Pasta dishes. Whenever he goes grocery shopping for me, he always comes home with some parsley in hopes that I’ll make this dish! 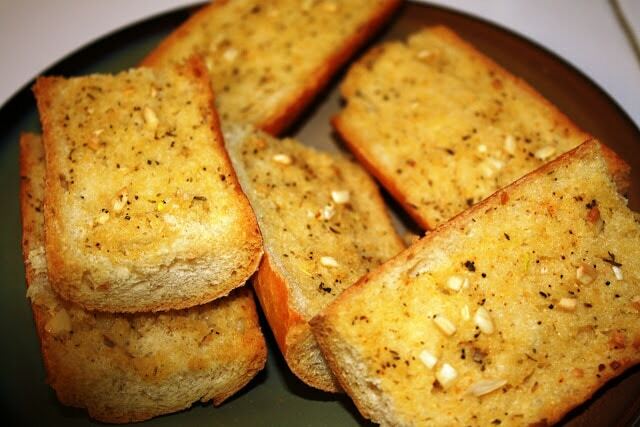 We typically enjoy it with a Caprese salad or some home-made garlic bread. Boil pasta al dente, drain, cool, and set aside. Meanwhile, continue with the recipe. In a non-stick pan , fry the garlic in 2 tbsp olive oil over medium heat until softened (be careful not to burn the garlic). Add the chopped parsley. Cook for about 5 minutes until the parsley is cooked down. Set this mixture aside in a bowl. 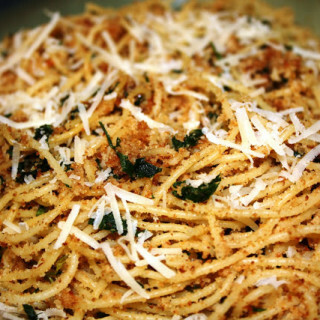 Combine all the ingredients to make Italian Style Breadcrumbs. Heat 3 tbsp olive oil in the same non-stick pan over medium heat and fry the breadcrumb mixture until evenly golden brown. Be sure to stir the breadcrumbs continuously so that they do not burn. In a large mixing bowl or pot, toss the cooked pasta, 4 tbsp olive oil, with the garlic/parsley mixture. Add the breadcrumbs, basil, and Parmesan cheese. Add salt/pepper to taste. Toss thoroughly until everything is combined and the breadcrumbs stick to the pasta (note: I don't usually state this, but this pasta is best mixed using your clean hands if possible to ensure that all the breadcrumbs coat the pasta). Serve hot, immediately with freshly grated Parmesan on top. I've omitted the basil many times (because I didn't have any at the time) and it still turns out great. What hot oil do you add? And is the herb mixture the parsley?